The Confident Cat (Once known As The Lop-eared Cat). Folded ears ensure that this breed is immediately arresting, it also has a distinctive rounded look, with a short neck, round head, and compact body. The first Fold had what is now called a "single" fold, where the ears bend forwards. Today's show quality cats have tight "triple" folds. Straight eared cats are still essential for breeding healthy Folds. The breed has a placid personality, and its undemonstative behaviour suits its reserved appearance. Susie, the Fold's founding mother, was a farm cat born in Tayside, Scotland. In 1961, local shepperd William Ross and his wife Mary were given one of Susie's kittens, named Snooks. Bred to a British Shorthair, she produced Snowball, a white male who was shown locally. In the mid 1960s, Pat Turner, a cat breeder and geneticist, became involved in the development of the Fold. Over the next 3 years she oversaw the breedings which produced 76 kittens - 42 with folded ears and 34 with straight ears. She and Peter Dyte, another British geneticist, agreed that the gene mutation responsible for folded ears is a simple dominant. This means that if a kitten inherits a gene from one parent for straight ears (fd) and one from a parent with the gene for folded ears (Fd), it will be a fold. They also learned that the original cats carried the longhair gene. In 1971, Mary Ross sent some Folds to Neil Todd, a geneticist in Newtownville, Masachusetts, USA. Development continued in the United States, using British and American Shorthairs, and Folds were fully recognised by 1994. A faction in the British Cat Fancy felt that the Scottish Fold would be prone to ear infections and deafness. They campaigned to prevent their acceptance for registry in Great Britain. Folds are still not accepted for registry in registries of Great Britain and Europe. Scottish Fold kittens are born with straight ears. At about three to four weeks of age, their ears fold... or they don't! It is usually around eleven to twelve weeks of age that the breeder can determine whether it is a fold or straight type. Due to the rarity of the Fold, and due to the fact that not every kitten born has folded ears, it is very hard for the supply to keep up with the demand. 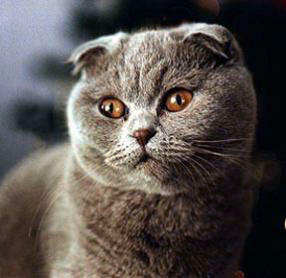 The Scottish Fold can be found in both the shorthair and longhaired version. The longhaired Scottish Fold has a semi-long coat of variable length which should sport a nice ruff on the males, leg britches and a huge fluffy tail. Folds with long hair are called longhair folds, in some parts of America they're called Highland folds, an attempted reference to the geographical origin of the Scottish fold. Highland is a misnomer, however, and a source of amusement to Pat Turner. "They're not from the highlands at all," laughed Turner. "Over here we call the longhaired folds Coupari," after the village near the cottage where Susie was discovered by William Ross. Scottish Folds are hardy cats, much like their barnyard ancestors. Their disposition matches their sweet expression. They have tiny voices and are not extremely vocal. They adore human companionship and display this in their own quiet way. They love to play but usually expect you to be involved in the fun and games. While not every Fold will be a lap fungus, they will usually be found close to you. Scottish Folds adapt to almost any home situation and are as comfortable in a room full of noisy children and dogs as they are in a single person's dwelling. They do not usually panic at shows or in strange hotel rooms, and they adjust to other animals extremely well. Scottish Folds love to sleep flat on their backs and can often be found sitting up looking very much like an otter. In general the Scottish Fold is a healthy, hardy cat with a lifespan of approximately 15 years. Early in the development of this breed a degenerative joint disease was discovered to be linked with breeding folded-eared cats to folded-eared cats. Because of this, ethical breeders will only breed straight-eared cats to folded- eared cats. Scottish Folds who are the products of folded-ear to straight-ear breedings seldom if ever develop joint disease. Affected Folds will usually show signs of the disease between the ages of 4 to 6 months. This disease, in its worst case, will cause the joints of the cat's tail, ankles and knees to fuse and stiffen. A Scottish Fold with a very short thickened tail is probably affected to some extent. While this health problem is disabling, it is not life threatening. Though it cannot be cured, it can be very successfully treated. If you want a cat who wants to know what you are doing and why you aren't paying attention to him, then you will probably do well with a Scottish Fold. If you are away at work for long hours then two Folds will keep each other from getting lonely and will be twice the love and devotion when you are home. Today, although many colours and patterns have been added to the Scottish Fold's wardrobe of kilts, Original White, as the mother colour of all tartans, still holds a special place in the hearts of Fold lovers everywhere. Breeding whites is now controlled to ensure only cats of sound hearing are bred from. And let us not forget the tribute in People magazine. In the 31st of May, 1999 issue there is a full page tribute to Norton, the most famous Scottish Fold yet. Norton was the constant companion of Peter Gathiers, author of two best selling books about their travels in Europe -The Cat Who Went to Paris and Cat Abroad.